Recent San Francisco survey results shows that driving has made up a minority of trips for at least three years. Image via SBSF. Last week, the Los Angeles Times published an article titled, “San Francisco residents relying less on private automobiles.” It is summarized at today’s Metro transportation headlines. The Times highlighted recent good news, reported in early February at Streetsblog SF, that 52 percent of San Francisco trips are taken by means other than a private car: walk, bike, transit, taxi, etc. The data are from a San Francisco Municipal Transportation Agency (SFMTA) survey examining all trips, not just commuting. The time frame is from 2012 through 2014. First, let’s celebrate! This is great news. 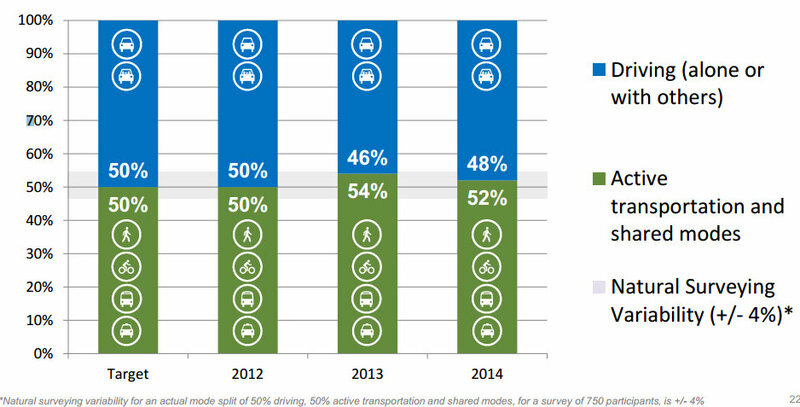 In California’s second-largest city one of California’s largest cities, sustainable healthy transportation holds a majority. Just how stark is this contrast between Los Angeles and San Francisco? Just based on area, how meaningful is comparing one county with another that’s over one hundred times larger? Or one city with another that is ten times larger? First, a comparison study by former Streetsblog S.F. writer Michael Rhodes, currently a transportation planner with the firm Nelson\Nygaard . Rhodes mapped out the 47-square-mile city/county of San Francisco and the corresponding densest 47-square-mile area of Los Angeles County. L.A.’s densest area centers in Koreatown, extending to Downtown, Hollywood, West Hollywood, and USC. 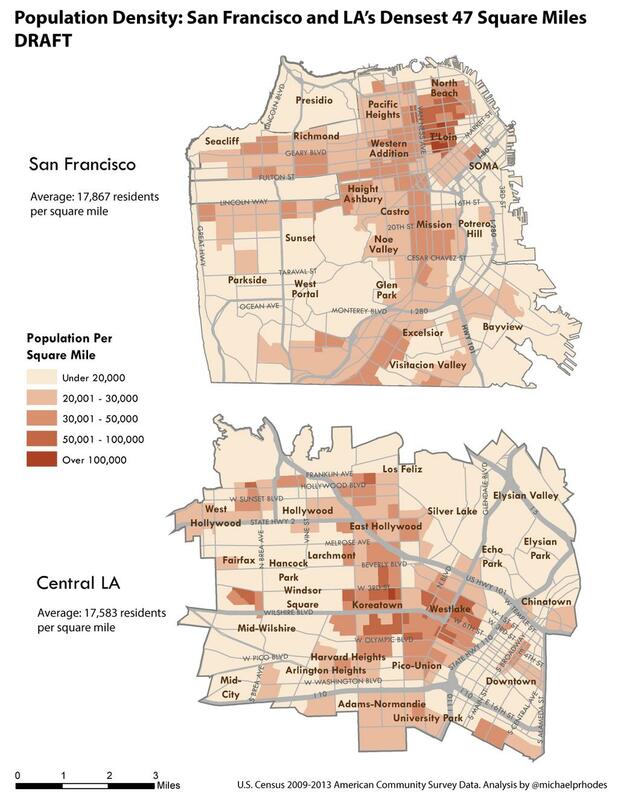 The population densities are more similar than different: S.F. averages 17,867 residents per square mile, while central L.A. averages 17,583. The dramatic difference in population density cited by the Times–“[S.F. City density] twice that of Los Angeles [City]”–shrinks to only a two percent difference. Rhodes also mapped levels of bicycle commuting in San Francisco and in the corresponding areas of central L.A.
Rhodes did not write any overall comparison characterizing these two maps. The way I read it, in around half of the area of both S.F. and Central L.A., bicycle commuting is close to nil (less than one percent of residents) S.F. appears to have a denser, more focused central area where bicycling is concentrated and exceeds L.A. overall, but significant parts of Central L.A. — especially Downtown to USC — are analogous to and even exceed the more heavily-bicycled parts of S.F. The USC area sees the highest rates of cycling in L.A. County, which helps L.A.’s numbers. There are a bunch of caveats that apply here. The U.S. Census data only counts commute trips, which ignores many short trips. Walking to the corner or bicycling to school or the park are not counted. Some of this rolling Census data dates to 2009, two years before L.A. approved its bike plan and stepped up implementation of bike lanes, especially Downtown. Recent data show increasing levels of bicycling statewide and locally. And, as my colleague Sahra Sulaiman pointed out, many of these of central L.A. neighborhoods are heavily populated by lower income immigrants (more so than the corresponding S.F. ), hence it is more difficult to study. These are the folks you are least likely to get data from because they don’t answer surveys. It is likely that central L.A. population density, and levels of walking, transit, and bicycling, may be under-counted. Los Angeles planner and cycling advocate Jeff Jacobberger examined a similar Central Los Angeles area, though with slightly different boundaries. The Census Bureau divides the City into Public Use Microdata Areas, or PUMAs. I’ve attached a map that shows the boundaries of 5 PUMAs that make up Central and East L.A. The boundaries are roughly the base of the Hollywood Hills to the north, the L.A. River and Boyle Heights/East L.A. to the east, roughly the 10 Freeway to the south, and Robertson/La Cienega/La Brea to the west (excluding Beverly Hills, West Hollywood, and the part of L.A. north of the City of West Hollywood). 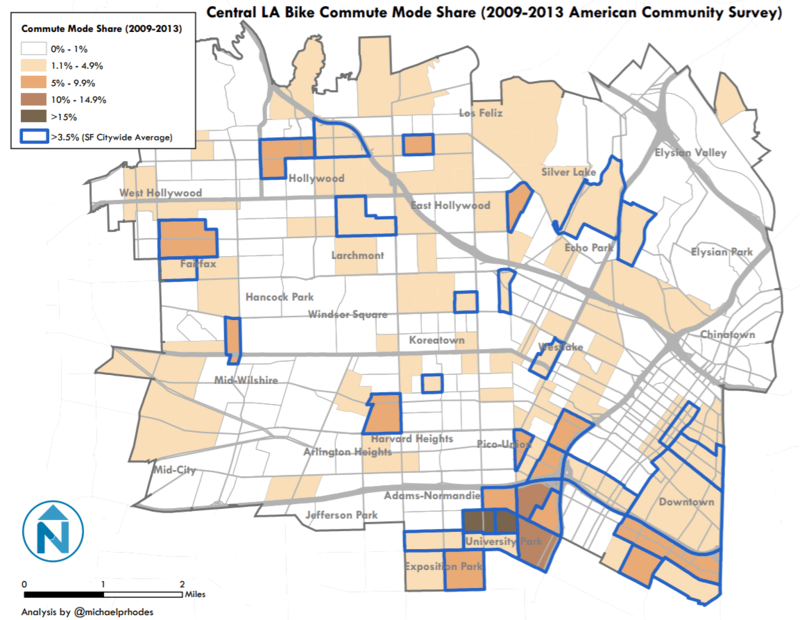 Jacobberger compared commute mode share from the 2012 U.S. Census American Community Survey for this 53-square mile area of Los Angeles to the overall city of Los Angeles and to the combined city/county of San Francisco. In Jacobberger’s analysis, S.F. still beats central L.A. for levels of transit, bicycling, and walking, but the Times’ “stark contrast” is diminished. Central Los Angeles commuting resembles S.F. more than it does the rest of the city of Los Angeles. Similar to the information above, the data are limited to commuting, a few years old, and likely to under-count low-income immigrant communities. Jacobberger found slightly lower levels of density and bicycling than Rhodes, because his overall boundary was slightly different, and did not include the USC area. The Times‘ sweeping generalizations about how all of L.A. County travels are misleading. Central L.A. and all of S.F. are somewhat similar, in terms of population density and transportation. Depending on where the lines are drawn, San Francisco appears just slightly more population-dense and has somewhat higher levels of transit ridership, walking, and bicycling. In terms of jurisdictions, though, the differences are pretty stark. The Times sort of spotted this, but chose to contrast transportation instead of contrasting politics. San Francisco is, in a way, fortunate that its city and county boundaries coincide, and represent a somewhat coherent whole. Los Angeles County and City have very broad political boundaries, and are hence much less cohesive areas than San Francisco. That central 50-square-mile chunk of Los Angeles is governed by a mayor who needs the votes of a majority of those who reside in the other 90 percent of L.A.’s land. In many ways, L.A.’s large area (both city and county) means that the fate of Central L.A. is politically more tied to L.A.’s less urbanized areas, at least in comparison to S.F. This jurisdictional breadth impacts Los Angeles’ urbanity. One-size-fits-all regulations do not fit Los Angeles so well. For example, parking needs are very different for suburban Chatsworth and urban Koreatown, although both are part of the city of Los Angeles. At the recent Live Ride Share conference, SFMTA Director of Strategic Planning and Policy Tim Papandreou’s presentation included Rhodes’ maps. Papandreou remarked that San Francisco’s transportation policies, facilities, and behavior had, until a few years ago, been more-or-less similar to that of central Los Angeles. In his presentation, Papandreou emphasized that recently S.F. has prioritized active transportation and transit, and has seen increases in those trip percentages. The city of S.F./Central L.A. City areas are roughly similar in population density. 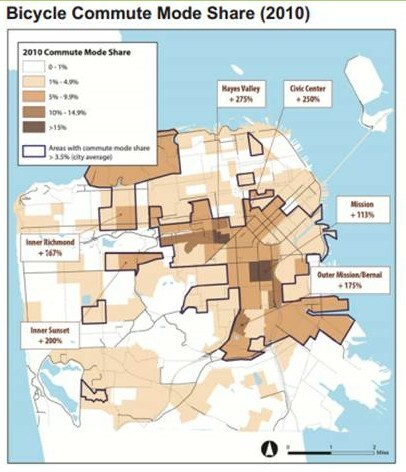 The mode share of S.F. 6 years ago and Central L.A. today are roughly similar, but now it’s 50/50 in S.F. That’s in part due to the street network changes, parking management, and transit service upgrades leveraging the land use developments and the influx of workers. L.A. is going through all these changes now, so it will be interesting to see how this changes mode share over time. Can the city and county of Los Angeles set aside our Times-echoed misconceptions and let central Los Angeles livability flourish? Could this spill over and foster walkability and livability at multiple centers throughout the L.A. area? We’ll see. San Francisco is not California’s second largest city, San Diego is. San Jose is the third largest city, followed by San Francisco in fourth place. The first thing I thought when I saw that story originally was that the San Fernando Valley would really skew the results for LA. City boundaries can vary widely, so it’s always problematic when trying to use them when doing demographic or statistical comparisons. That’s one of the problems I have with the way Walkscore works. – I suspect that LA is not nearly as densely built as SF, and that much of those census tracts around Central LA are due to poverty and overcrowded slum housing (whereas SF has gentrified to the extreme.) I worry that population density in LA will drop before it increases, as our central neighborhoods are revitalized. And this will make it harder for smart growth advocates to use the data to justify road diets and more conventional urban zoning. Kinda makes me wonder if the valley seceding might’ve been to Central LA’s benefit over time… less infrastructure to maintain, more support for traffic calming and proper urban development. this is not the case. you can argue that LA is not as built for walking as as SF, but koreatown, westlake.. basically anything between downtown and western ave (and of course south of sunset) is big city density, the 5 and 6 story apartments with larger residential here and there. no offense but if you can afford san fransisco, you’re probably not familiar with this area. as for “slum housing” density and overcrowding, that is what you see n the gateway cities like cudahy and south gate. MacArthur Park is know to have overcrowded slum conditions. Particularly because it’s long been an arrival neighborhood for poor immigrants from Central America. I think if the area gentrifies, population density could easily decline in the interim (and possibly hurt the argument for infill development.) Wasn’t that more or less the ammo NIMBY’s used to get a judge to block the Hollywood Community Plan last year? about strip malls… in koreatown and elswhere in central la, they are actually 2 or three stories, which makes up for their meager parking lots.. so higher commercial density. but again this brings up the issue of la being pedestrian unfriendly, so even with this higher density it would be better if there was storefronts, which there still are. and i revise my argument. central la has big-city density AND overcrowding, like you said in westlake, but the reason there isnt new york levels of density is because there are also “dingbats” and old homes mixed in with the apts. Knowing both cities well, I appreciate this first focused effort I’ve ever seen to carve out a SF-sized chunk of LA to bring comparisons closer to apples-apples. It isn’t enough, though, because if you bring in the three closest big cities to SF (Oakland and Berkeley to the East, Daly City to the south) you expand the area beyond SF’s 47 sq mi by five times and still sustain a higher transit mode split. The reason seems to be based on two Bay Area features LA lacks: largely-intact 19th Century small block/street grids plus formidable geographic constraints that channel traffic (that intensify and toll congestion, and create viable transit corridors). It clearly helps that Berkeley, SF and Oakland were extensively built out before the auto era, and that the narrow shelf between the Bay and the Hills reigned in sprawl to the extent it could. I looked at the maps again and recognized something not discussed but obviously in play here: Central LA has 4 times the freeway coverage of SF in the same area. I checked parking requirements for SF and LA — central LA essentially requires 3-4 times the off-street parking of SF as a whole, and up to eight times as much as is permitted (not required) in central SF. The carrot-stick strategy that influences travel behavior so well in SF (robust transit plus limiting parking and auto capacity) was mentioned often in the LA Times article, but in LA, even with its impressive transit investments, the sticks are pretty flaccid. Parking supply and freeway capacity reduction seem the correct next frontiers for LA’s continued transformation. Good points… I think we’re on the same page. Central LA isn’t really suffering from a lack of density. The area has just been devalued by decades of car-centric zoning codes and highway geometry imposed on the streetscape. This is why SF is expensive. It’s virtually impossible to build neighborhoods of a similar scale and feel nowadays. San Francisco is just a victim of it’s own success – America could use a dozen more cities just like it. But to be fair, to make that comparison you would then have to bring in the very dense residential areas that are south and east of downtown LA that are not in the City of LA: East LA, Florence-Firestone, Maywood, Huntington Park, etc. I’d bet those areas are denser than the urban core of the East Bay even if you throw in almost uninhabited Vernon and heavily industrial Commerce (as you probably should to make a contiguous area). I’ve estimated that there is a contiguous “City of Central LA” that has over 1.8 million people that has a total density of more than 15k ppsm. 1. The “rest” of the city of L.A. (the other 90%) has somewhat more car-centric numbers if we take out the central 10% out. Jacobberger includes the central area in his overall city percentages. 2. There’s a less car-centric area that’s 47 sq miles instead of Jacobberger’s 53 sq miles. 3. The central L.A. area is a little less car-centric than the percentages reflect, in that non-car stuff is likely under-counted. If each of those moves the needle say ~5%, then what I wrote seems likely to be true. Great article, Joe. Having lived for many years in the Bay Area and spent a lot of time in LA, I’ve always been more struck by the similarities between greater LA and the Bay Area than by the differences. I think that many people get overly swayed by the cityscapes they see in the relatively tiny part of the Bay Area (i.e., the northeast quadrant of SF) that is on the classic tourist circuit, and by the lazy and outdated stereotypes of auto-crazed LA. And then of course the jurisdictional issues that tripped up the LA Times don’t help matters. This much more sophisticated analysis shows that Central LA is still falling short of SF for multimodalism. But at least now we’re comparing apples to apples. And like others here have suggested, LA (or at least Central LA) is going to start closing the gap, fast. Yah – I tried to convey that, even though densities are more-or-less equivalent – SF has a small edge. Intuitively, it is a little more urban, and its policies embrace livability more than L.A. City. Overall, though, the similarities are underplayed – and the contrasts are overplayed. For each of the four transportation modes you cited, the numbers for Central LA were closer to LA City than to SF; in some cases significantly so. A much more accurate takeaway from this study is that Central LA, despite having similar size/density to SF, still relies more heavily on private automobiles for transportation, like LA city and LA County in general. What would also be fair is to say that this post is about the 47 sq. mi. urban cores of the two largest urban areas in the state, even though there is no natural jurisdiction level at which to compare the two things, or even state that they’re the two biggest. I mentioned below that I extrapolated/guestimated based on three factors not explicit in the statistics cited:1. The “rest” of the city of L.A. (the other 90%) has somewhat more car-centric numbers if we take out the central 10% out. Jacobberger includes the central area in his overall LA city percentages. The American Community Survey does statistically weight for lower response levels in lower income communities and with immigrants. While the survey is ridiculously intrusive (I once was selected), asks redundant questions (classifying an occupation, job title, and list tasks done which I wrote a joke answer), and extremely broad, it is the best that we have. The comparison is a little uneven in that more of San Francisco is larger than that of central Los Angeles. Much of the east side of San Francisco is non-residential. So if you compared the density of the residential areas only, San Francisco would be somewhat higher. San Francisco’s density is somewhat more clustered. A lot of LA’s dense areas are clustered, but there are a lot of isolated locations–in Downtown, Chinatown, Mid-City, Mid-Wilshire. The Red Line faithfully follows the route of highest density. Some of that is Red Line oriented development, but a lot of that was there before. You can also see why Alvarado, Vermont, and Western are such strong bus routes. There’s tons of potential transit ridership on that map. To me, the biggest difference between San Francisco and Los Angeles is the walking environment, which is also important to the transit environment. Not always, but for the most part it’s a lot better in San Francisco. In LA, there are places like Vermont Ave. in Koreatown–very dense, but with tons of parking right next to the sidewalk, driveway cuts etc. It’s a bad environment for pedestrians, and it’s also dangerous. I agree that they have a higher transit mode split but that seemingly has more to do with their more traditionally, mono-centric model and that SF itself a higher gravity pull of jobs by percentage then DTLA. I think we will really start to see that split difference diminish with the completion of Expo 2 and more importantly purple line extension. These will transit lines will finally get to the westside which has higher density of people and has really bad traffic which gives people more of an incentive to use transit. I thought of many of the same high-density areas beyond central LA: densities exceeding much of Oakland, Berkeley. However, the mode splits are what are of main interest: my point is that throwing the net beyond SF to rope in these cities further emphasizes a transit disparity with a similarly broader area of LA, rather than shrinks it. I imagine that mostly is a function of geography and the Bay/Ocean/Hills constraints that limit corridors between SF and Daly City, Berkeley and Oakland. The relatively few highway corridors make auto travel more congested, and make transit an increasingly attractive alternative. The LA area doesn’t have this constraint to the same extent, and a plethora of freeways…and an accordingly higher auto mode split. I’m very optimistic about these west-side corridors! I do think they’ll hugely uptick transit ridership and the overall transit mode split. Joe, I really appreciate the nuanced and thoughtful analysis of both your article and your responses. I look forward to reading much more from you! For sure. And especially since the Gateway Cities are pretty underserved by transit, since the Blue and Green lines miss the densest areas (Bell, Maywood, Huntington Park, Cudahy, etc). If the proposed LRT from Santa Ana all the way to Union Station, passing through that area, were ever built, it would probably have close to the highest ridership in the country. I’m just curious, does the figure for SF-OAK-HAY include the bay in it’s square miles or just the actual land area? Joe! I’ve been thinking about this article a lot, probably because it’s so fun (for me) to think about the relationship between the Bay and Los Angeles, and to find a geographic area that resembles the density and land use of SF in LA is pretty neat. The next step might be to contrast how these places are different and to ponder how difference in transportation behavior is correlated to differences in other areas (i.e. demographics). Being in SF, at possibly a time with insane wealth-generation, just the other day, my coworkers were saying that taking an Uber or Lyft has become TOO easy an alternative to when people SHOULD be walking or biking. It’s crazy. Plus, I think consideration of these differences could help shed light on 1) how the narratives of growing bike/ped mode shift diverge and 2) what those changes actually look like, whether they’re actually very similar based on fads in planning practice, or whether they’re customized for each population. Lastly, I’d like to challenge you to do the opposite mapping. Find the LA in the Bay. Is it even possible? What wold that look like? I know there is plenty of car culture up here, besides the SF snobs, but the geography is kind of bizarre. Is it completely incomparable? Or, maybe parts of the South Bay here resemble the South Bay in LA? Keep up the great inquiry! Way late but the areas do not include water but do include uninhabitable mountains.